Cerreto Guidi, a lovely Renaissance village in the province of Florence, offers a special summer rich in various types of events. Its beautiful historical centre will be the setting of many of these interesting initiatives. 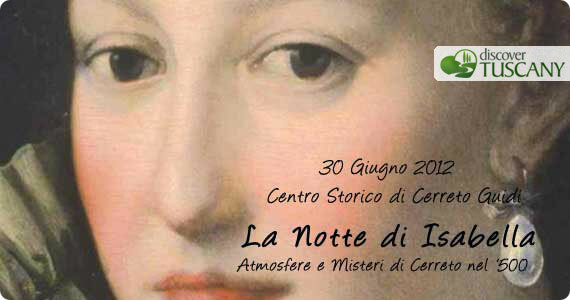 The first event on the calendar is the upcoming “Night of Isabella, Atmosphere and Mysteries of Cerreto Guidi in the 1500s” this Saturday June 30th, 2012. The event commemorates the unlucky Isabella dei Medici whose mysterious death has led to many legends, including the one where her ghosts still roams around the Villa Medicea. During the evening, the Villa Medicea in Cerreto Guidi will be open extraordinarily for a guided tour of the villa, to be followed by the reading of the her letters to her husband, Paolo Giordano Orsini. Walking across the streets of the historical centre you will be taken back in time to the 1500s: Renaissance games and dances, crossboard, games with fire, street artists, a parade in Renaissance period costumes of the 4 neighborhoods of the town, flag throwers, musicians and much more. At 9pm in the main square, Isabella’s sad story will be recounted and the celebrations will continue for the rest of the night into the late hours. For those in the area, we highly recommend head to Cerreto Guidi for Sagra del Papero e del Cinghiale, a food festival dedicated to dishes made the very Tuscan tastes of wild boar and goose at the “Circolo ARCI”, the recreational community space in town. The food festival will start June 28 and last until July 15 (closed on Mondays). The sagra represents a special occasion to taste the flavors and history of Tuscany. The summer evenings in Cerreto continue with “Summer at the Museum”, a series of guided tours of the Villa Medicea and the historical centre of Cerreto (from July 1- July 15, 2012) and the painting exhibition “Artist in Cantina” at the Cantine Verdi (Via della Libertà, 24). The exhibit opens June 30 and runs through July 15, open weekdays from 8pm to 12am, while on Saturday and Sunday it opens from 5pm to 12am. Another summer event you should not miss is the “La Medicea Festival” which runs in Cerreto Guidi from July 9 through July 17 completely dedicated to wine, perfect for anyone that loves wine and its story. Every night one can taste and buy excellent wines in Piazza Umberto 1, right in front of the villa. This will also be the setting of the Rubino Mediceo contest where the best Tuscan wine producers win prizes and support for their goals in achieving the highest quality wines. Toward the end of summer, if you’re in the area, head back to Cerreto Guidi for the Historical Costume Paradestrong> on August 31st and the Palio del Cerro held the day after, on September 1st, in honor of Santa Liberata, the patron saint of Cerreto Guidi.